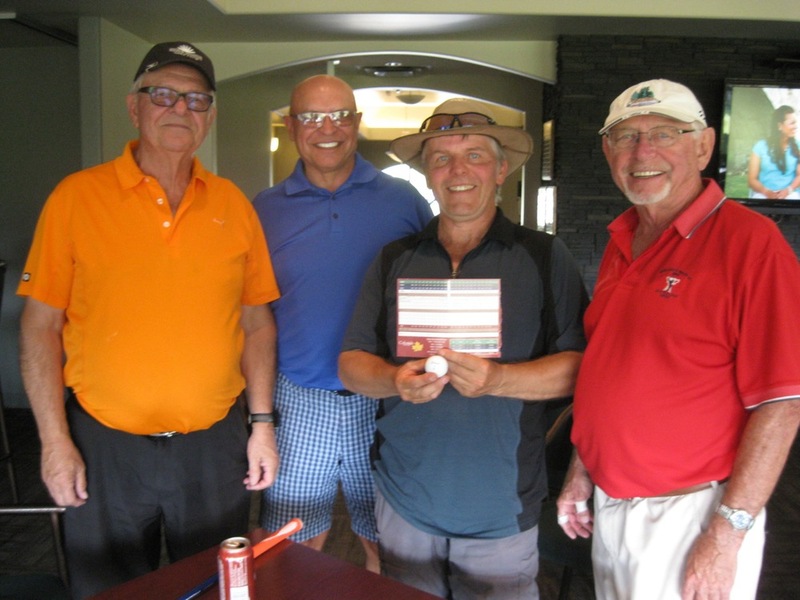 Darryl Wolter scored a hole in one on May 17, 2017 on the 7th hole at Victoria Golf Course playing in the Senior Mens League. He was using a #5 hybrid club on this hole that normally plays about 150 yards. 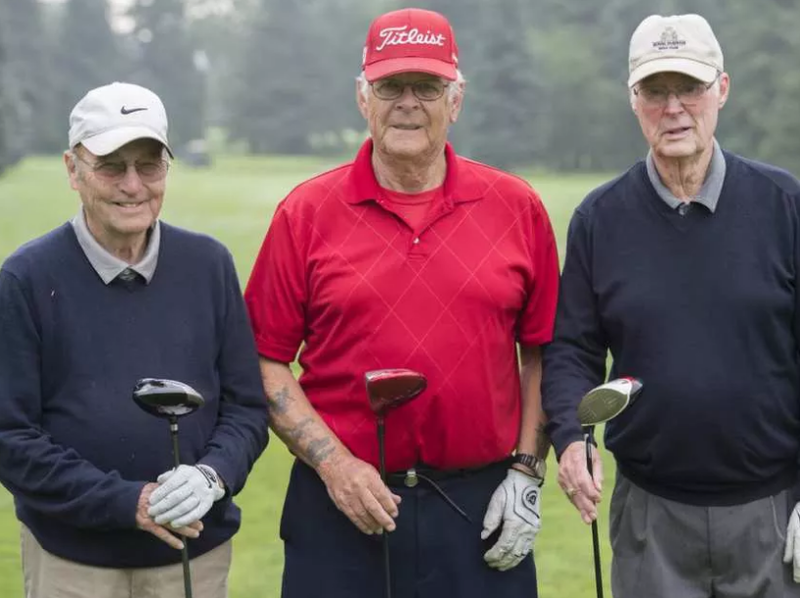 The shot was witnessed by his playing partners Gord Kirkwood, Al Henderson and Brian Kirkwood. Darryl said "I have been playing golf with Brian for the last 20 years. First time I play with his brother Gord – Hole In One! Guess who is going to be my partner from now on..."
The Presidents Cup has been rescheduled to June 7. Everyone is included. Keep your score and hand in the scorecard at the end of your round. When play is completed everyone meets in the clubhouse for a free soup and sandwich lunch. The scorecards are randomly divided into two piles, and the scores of each pile are totaled. One pile represents the President's team and the other pile is the Treasurer's team. Each player on the team that used the fewest strokes wins a golf ball. It required 8,479 strokes to determine which of Dave’s teams won the challenge. The President’s team averaged 96.86 strokes per player. The Treasurer’s team averaged 95.79 strokes per player. The losers were consoled with some fine chocolate chip cookies. A new Rule prohibits anchoring the club either “directly” or by use of an “anchor point” in making a stroke. The penalty is loss of hole in match play or two strokes in stroke play. If a ball at rest moves after the player addresses it, the player is no longer automatically deemed to have caused the ball to move. A one-stroke penalty will be applied only when the facts show that the player has caused the ball to move. In certain tournaments, laser and gps range finders are not allowed. The penalty for a player’s first breach of this during the round has been reduced from disqualification to loss of hole in match play or two strokes in stroke play. The penalty for any subsequent breach will continue to be disqualification. L to R , Horace Chyzowski, Mike Dumanski, Gordon Eikeland= Hole in One, and David Mclean , witnesses at Colonial Golf Course, July 6- 2015 NASA golf tour. Gord also shot a One under par = 71. I've heard golfers on the PGA tour say that trees are 90% air. I guess they haven't met the trees on Victoria. That is also why you never see tips on the Golf Channel on how to play the shot faced by Dave Redden. According to Dave Mclean (who does not embellish), Dave Redden played a second shot out of the branches , third shot on to the green and dropped the putt for 4.